Dan Allen, pastor of the Grace Brethren Church, Ashland, Ohio, lead the retreat on Monday afternoon. 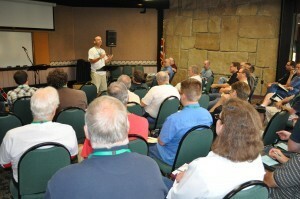 The first of six regional Focus Retreats for pastors and ministry personnel began Monday afternoon at the Mohican State Park Lodge near Loudonville, Ohio. Ministry leaders from Grace Brethren churches in Pennsylvania, Ohio, Indiana, and Illinois have gathered for two days of reflection and refreshment. Following the theme “Fully Alive,” the retreat provides participants an opportunity to step away from their regular responsibilities to focus on what is happening in their own lives. 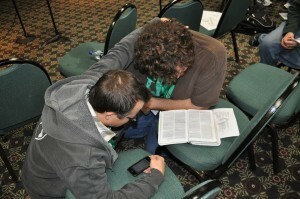 Participants in the Central Focus Retreat ended the evening praying Ephesians 3:16-21 for each other. The events are being led by Dan Allen, pastor of the Grace Brethren Church, Ashland, Ohio, and Tony Webb, executive director of Vision Ohio.